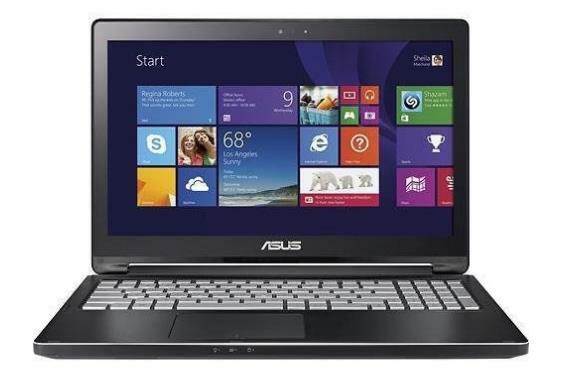 The Asus Q551LN is a 15.6-inch 2-in-1 laptop with a dedicated video card as a stand out feature among similar systems. omputing and display are powered by the higher-end Intel Core i7-5500U dual-core processor and mid-range Nvidia GeForce GT 940M dedicated graphics with 2GB of video memory. Another feature of the Asus Q551LN-BSI709 which isn’t common on 2-in-1 convertibles is a built-in DVD drive. Keyboard backlight is an appealing feature, too. The laptop has stereo speakers, a 1MP 720p webcam, 802.11AC Wi-Fi wireless, Gigabit Ethernet LAN, Bluetooth, three USB 3.0 connectors, HDMI external display output port, Intel Wireless Display technology for wireless connection to external screens, a multi-format media card reader, and a combo headphones/mic audio jack.